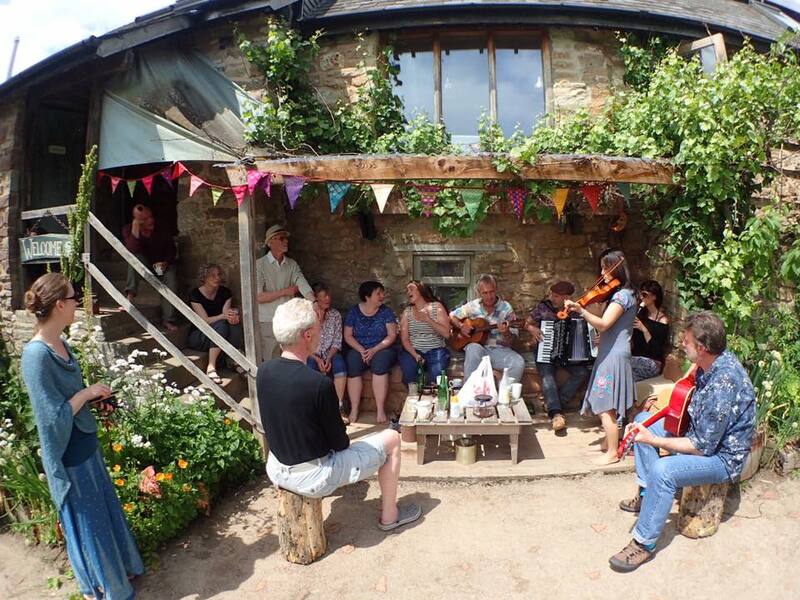 The Singing Retreat in the Wye Valley is a singing holiday that runs on the Spring Bank Holiday weekend at the end of May, which in 2019 will be from Friday 24th May to Bank Holiday Monday 27th May. The earth will be warm and blossoms in full bloom, so come and sing the summer in with your hearts and voices! 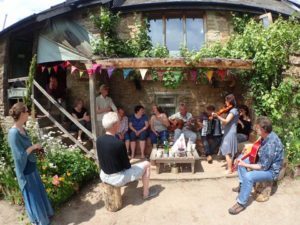 The Singing Retreat is held at Ragman’s Farm, a beautiful organic permaculture farm in Lydbrook which is nestled in the heart of the Wye Valley. Take a look at their website http://www.ragmans.co.uk/home/ although the photos don’t really do the place justice! The facilities are superb. If you’d prefer to sleep indoors, the ‘Bunkhouse’ has beds in shared rooms. Camping is also available with stunning views across the valley, as well as spaces for live in vehicles. There is also a luxury option of the yurt which comes equipped with a wood burning stove, a king sized bed and kitchen facilities. In the Bunkhouse, there is a large kitchen and dining area where all your food is prepared and cooked – delicious home cooked meals are provided from Friday evening to Monday lunchtime. There is a large hall for workshops in the daytime, a comfortable chill out space for evening gatherings, nice indoor toilets and showers, outdoor eco toilets and an outdoor fire pit and hot tub. All the indoor spaces have heating and open out onto the farm land which has orchards, a lake and beautiful views of the Wye Valley. You can arrive on Friday any time after 5pm and enjoy the idyllic surroundings. Dinner will be served at 7pm. Over the long weekend, there will be a glorious array of four part harmony singing, ranging from uplifting Gospel, Shape note, contemporary, Folk and World music. Early morning yoga will be on offer for those who fancy some bodywork and invigorating stretches in the morning. There will also be a whole camp ceremony on the Sunday. The Cabaret on Sunday evening will be an opportunity to perform/share your talents. On the Monday morning, there will be a final singing session followed by lunch and then the camp will finish Monday afternoon. Bring your musical instruments for jamming and singing sessions in the evenings. The Singing Retreat in the Wye Valley is a wonderful few days of singing, jamming, celebration and community in beautiful surroundings. The retreat is in its ninth year and always gets fully booked up so do book early if you want to come! Please Contact us if you’re interested in booking a space for the Singing Retreat or would like more information. The cost of the retreat including all meals from Friday evening to Monday lunchtime is £185 camping or £210 for dormitory accommodation.